Imagine using your tax refund to remodel the kitchen. After a long, economically challenged year, many homeowners can look forward to one bright spot on the New Year horizon: the expectation of a tax refund to help fund much-needed home fix-ups. It?s hard not to want a fashionable, newly remodeled home, especially if your cabinets are cluttered and crumbling from years of use, and the bathroom is so out of date you?re embarrassed to have company visit. Now is a good time to do a little advance planning for remodeling to ensure every hard-earned dollar is used wisely. 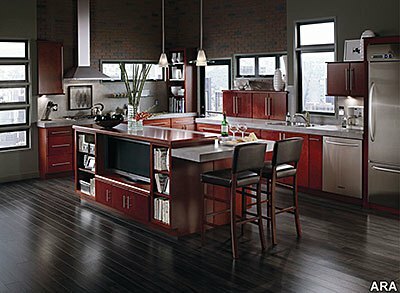 One way to stay on budget is to take the advice of the National Kitchen and Bath Association and prepare a top-10 list of must-have items. Look around your kitchen and bathroom and decide what needs to be replaced and what can be added later. If you can?t afford an entire kitchen remodel right now, perhaps you can update a kitchen island in a contrasting cabinet style, add a bathroom storage cabinet, put in new countertops or refresh paint and flooring. To get all you can out of your budget, squeeze as much as possible out of your space. Many cabinetry designs offer built-in storage and organization features?even in spaces just a few inches wide. From brown-bagging your lunch to foregoing movie night, we have many opportunities to find savings. Even though New Year?s Day is just behind us, April 15 isn?t that far away, and many Americans may be facing the unpleasant reality that their paycheck withholdings won?t be enough to cover their taxes and they?ll need to dip into their savings to cover the bill. ?Having to use your savings to pay an unexpected tax bill can be upsetting, but it doesn?t need to spell financial disaster,? says Steve Krenzer from LowerMyBills.com. ?Many Americans may find that with just a few simple steps they can start saving money and get their bank accounts back on the road to recovery.? Each year, more Americans choose to file their taxes online due to convenience, faster turn around on refunds and more accurate returns. In fact, the Internal Revenue Service reported that more than 86 million taxpayers filed taxes online during the 2008 tax-filing season, a 12 percent increase from the previous year. While e-filing continues to grow in popularity and hard copy returns become a thing of the past, Americans still send and receive a large quantity of confidential information on paper documents. W-2 forms, old pay stubs and investment information?all can leave you vulnerable to identity theft.